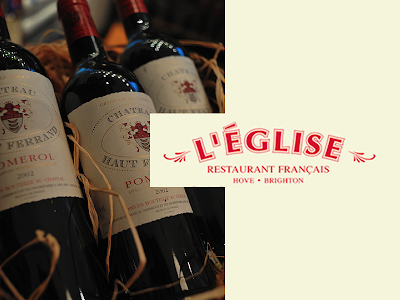 L'Eglise is Brighton's (well Hove actually) well loved French restaurant. Rather excitingly, they have started to run a monthly wine tasting dinner, each focusing on a different region of France. The next one is on 30th November 7.15pm and will concentrate on the South East region of France, with 5 regional courses and a wine to match each (see menu below). This costs £70 per person and you will be guided through by wine expert Andy Wiseman. On another subject L'Eglise have also started stocking 50 or so wines covering all regions of France (and a few non French wines too), many of them available as a 75ml taster, 175ml glass or a 500ml carafe which is handy if you want to try a few. Well worth popping in I say.